The Israeli occupation continues to violate the rights of Palestinians in Jerusalem since the decision by US President Trump to relocate his country’s embassy to Jerusalem in December 2017. 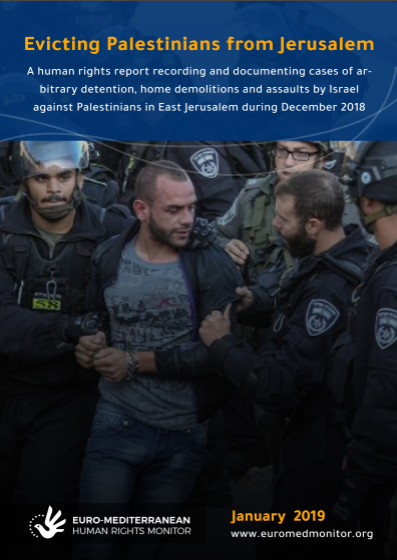 The Israeli occupation forces continue to increase arbitrary arrests, house demolitions and displacement, as well as re-arrest of Palestinian prisoners once they leave prison gates. Israeli settlers, accompanied by Israeli forces, also continue storming Al-Aqsa Mosque, provoking the feelings of Muslims in the holy compound. The Israeli occupation practices the arrest of Palestinians as a tool of pun-punishment and intimidation without any legal or moral justification, and not as a means of prevention. In a clear and explicit violation of the law, the Israeli occupation subjects some prisoners to administrative detention for six months, without charge or trial, as a form of open punishment. In an arbitrary move, administrative detention can be extended every six months. To justify their arrest, the Israeli occupation authorities imprison Palestinians under broad charges. Such charges include ‘disrupting public order’ for merely being present at the mosque area when Israeli settlers move in.